In the absence of U.S. federal leadership on climate, what state, local, community or corporate solutions can be rapidly scaled? As a farmer and a marine biologist, and as mother and daughter, we have had two decades of dinner table conversations about the connections between agriculture and the ocean and about the alarming trends in soil health, ocean health and climate change. These discussions have converged on an underappreciated solution: regenerative farming of both land and sea. Put simply, regenerative goes beyond sustainable or organic, and actually restores soil and ocean health. This can put massive amounts of carbon back into soil and plants (sometimes called carbon farming) while reducing use of pesticides and fertilizers, growing a cornucopia of healthy food and supporting local economies. Win-win-win-win. Our soil is in serious need of restoration. The United States has lost around half of its topsoil since John Deere first started producing plows in the 1830s, and industrial agriculture has led to 50-70 percent of soil carbon being released into the atmosphere. To quote soil geologist David Montgomery, “It only takes one good rainstorm when the soil is bare to lose a century’s worth of dirt.” And we’ve certainly been getting a lot of good rainstorms. Hurricanes starkly show that agriculture, climate, human health and ocean health are deeply intertwined and that industrial agriculture is broken. Hurricane Florence caused massive lagoons of pig excrement to overflow and millions of chickens and pigs to drown. Rains wash waste, fertilizer, pesticides and topsoil into rivers and out to the sea, harming wildlife, disrupting the balance of nutrients and causing dead zones and blooms of toxic algae. Hurricanes are devastating, yet they are also a chance to consider how we rebuild. 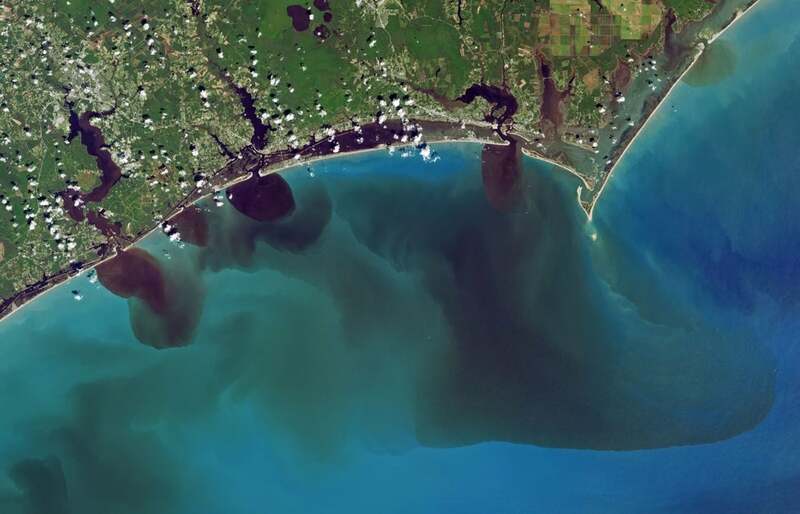 Rivers flooded by rainfall from Hurricane Florence pouring polluted water into the Atlantic Ocean. Credit: Joshua Stevens NASA. There is also plenty of room for improvement in how we farm the ocean. Far too much of the emphasis so far has been on fish. Farming fish requires lots of feed and can pollute waters with pesticides and antibiotics used to treat lice and disease, result in escapes that spread disease to nearby wild fish populations and generally require a lot of infrastructure and care. Improved feed options and technologies are trying to address these drawbacks, but to focus on honing fish production is to miss a greater opportunity. Regenerative ocean farming, as pioneered by Greenwave and others, means growing seaweed and shellfish (oysters, mussels, clams) in many small coastal underwater gardens of a few acres each, not constructing more industrial salmon farms. Seaweeds and shellfish don’t need to be fed; they grow with just sunlight and the nutrients and plankton already in seawater. As pioneering ocean farmer Bren Smith summarizes, “the real kicker” is that these low-maintenance ocean plants and animals “require no fresh water, no deforestation, and no fertilizer,” plus they improve water quality and create habitats for other species. The ocean already absorbs around 40 percent of the carbon we release into the atmosphere (thank you, ocean), but this has resulted in ocean acidification, which makes it harder for shellfish and corals to grow their shells and skeletons. Instead, absorbing that carbon into plants via ocean farming and marine permaculture can provide healthy food while being a significant part of the climate solution. Kelp can grow over one foot (30 centimeters) a day and help locally reduce ocean acidification. A single acre of ocean can produce 25 tons of greens and 250,000 shellfish in five months—a network of small underwater farms totaling the size of Washington state could feed the planet, not to mention the incredible potential for algae biofuels. There’s a win-win on the ocean side too. When it comes to our health, seaweeds, aka “sea vegetables,” are a high-nutrient “superfood” we would do well to eat more of. Seaweeds are rich in protein, iodine and other minerals for which deficiencies are commonplace. We can also feed seaweed to livestock. Fun fact: Cows fed certain seaweed species belch 58 percent less methane, significant because methane is at least 34 times more potent a greenhouse gas than carbon dioxide. Even better, research shows that a diet containing shellfish has an even lower carbon footprint than being vegan. So ditch that factory-farmed bacon, and head to the nearest oyster happy hour. Our atmosphere is overloaded with carbon, but carbon itself is not the enemy. From the stunning process of photosynthesis, to the transfer of energy in ecosystems, it is a vital element, the backbone of life. Through regenerative farming, soil and seaweed, we can draw down CO2 and feed ourselves while healing the planet. These are not cute, niche hippie concepts, but robust, scalable climate solutions that can feed the world. It would be naive to expect Congress to use the Farm Bill as a moment to support a transition toward regenerative practices, instead of continuing to subsidize environmentally reckless farming. 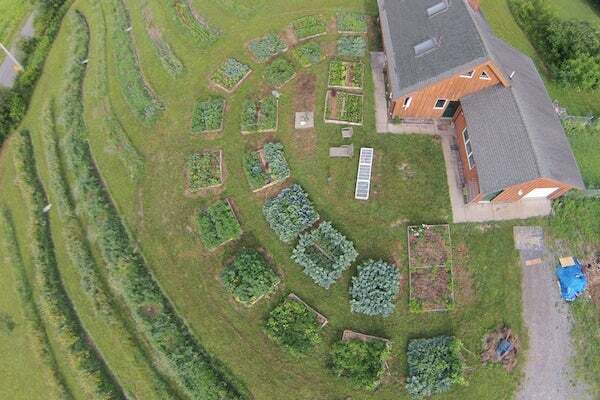 So we must turn to state and local emergency solutions to the climate crisis, including a return to the successful World War II victory gardens. Climate victory gardens, as proposed by Green America, would use regenerative practices to quickly convert lawns, public spaces and coastal waterways into carbon sponges and nutritious food. Everywhere there is space for a garden, every shoreline, and every person can be part of this fast, low-tech victory over our climate crisis. Climate health is soil health is ocean health is human health. If we can muster the will before it’s too late, we can have our nutritious oysters and tomatoes and a livable climate too. Louise Elizabeth Maher-Johnson is a retired English teacher and current regenerative farmer, who raises heritage chickens at Skyhill Farm, and who raised Ayana.